CHICAGO (May 12, 2015) – Cuban boxing sensation Erislandy “The American Dream” Lara (20-2-2, 12 KOs)returns to the ring on Friday, June 12 to face veteran Delvin Rodriguez (28-7-4, 16 KOs) as Premier Boxing Champions heads back to Spike. Additionally, Russian knockout artist Artur Beterbiev (8-0, 8 KOs) is set to square off against the ring-savvy Doudou Ngumbu (34-6, 13 KOs) of Haute-Garonne, France. “On June 12, I am going to change everyone’s mind about me and show that I can beat Lara,” said Rodriguez. Tickets for the live event, which is promoted by Warriors Boxing in association with Group Yvon Michel (GYM), are priced at $151, $101, $51, and $31, not including applicable service charges, and are on sale now. To charge by phone with a major credit card, call Ticketmaster at (800) 745-3000 or UIC Pavilion Box Office at (312) 413-5740. Tickets are also available at www.ticketmaster.com or by visiting the UIC Pavilion Box Office (Thursday or Friday 9:00 a.m. – 4:00 p.m.). The 32-year-old Lara is a slick boxer with the ability to deliver punishment while taking very little of it in return. 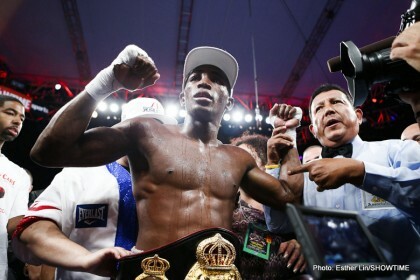 Lara has notched victories over Alfredo Angulo, Austin Trout and Freddy Hernandez throughout his career. As an amateur, Lara won numerous titles including a national championship at welterweight and also participated in the 2007 Pan-Am games. The fighter originally from Guantanamo, Cuba but fighting out of Houston most recently defeated former world champion Ishe Smith on his way to his 20th professional victory. Already deep into an accomplished career, the 35-year-old Rodriguez looks to give Lara a stiff test and entertain the crowd at UIC Pavilion on June 12. Having battled the likes of Miguel Cotto and Austin Trout, Rodriguez has also picked up victories over Mike Arnaoutis, Pawel Wolak and Shamone Alvarez throughout his accomplished career. Born in Santiago de le Caballeros, Dominican Republic but fighting out of Danbury, Connecticut, Rodriguez will look to improve on his last outing, a draw against Joachim Alcine in May 2014. Having floored every opponent he’s faced professionally, the now 30-year-old former amateur standout Beterbiev will be seeking to keep his knockout streak alive in Chicago. Having notched impressive wins over Tavoris Cloud in 2014 and Gabriel Campillo earlier this year, the heavy-fisted Russian knows he’ll be tested with an experienced opponent on June 12. Following a hard-fought loss to Andrzej Fonfara in November 2014, France’s Ngumbu rebounded nicely with a knockout win in January of this year. The battle-tested 33-year-old veteran will look to use his wealth of professional experience at UIC Pavilion in order to emerge victorious. For more information visit www.premierboxingchampions.com, www.spike.com/shows/premier-boxing-champions, follow on Twitter @PremierBoxing, @LaraBoxing, @DRodriguez1980, @WarriorsBoxProm and @SpikeTV and become a fan on Facebook at www.Facebook.com/PremierBoxing, www.Facebook.com/WarriorsBoxingPromoand www.Facebook.com/Spike.